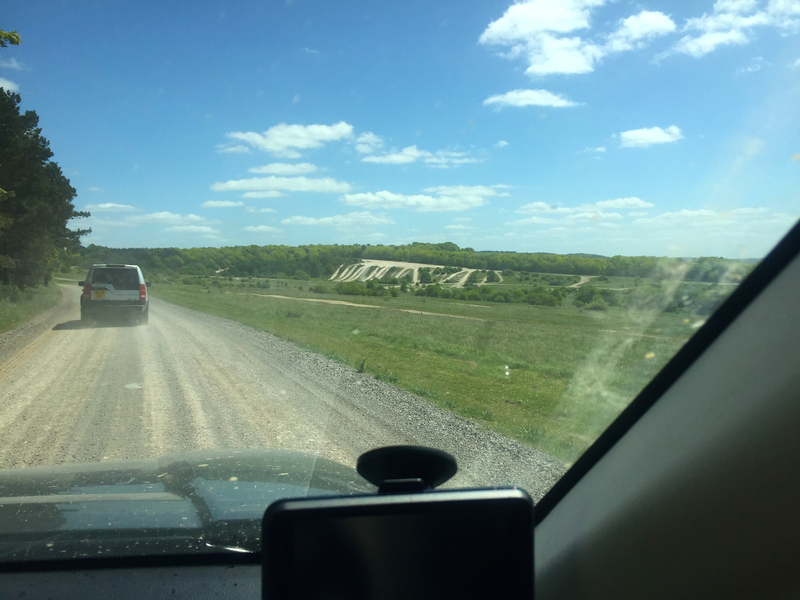 My off-roading chums organised a green lane trip on Salisbury Plain. It was billed as “non-damaging” so I decided to take my Freelander 2 (which we call “R2”). The Freelander doesn’t have the ground clearance of the Range Rover or Discovery 3’s in our group but, apart from a couple of lanes with deep ruts (which I dealt with by straddling the ruts) and a water splash which looked very deep from where I was (and which I chose to miss out), R2 took everything in his stride. Most of the time I had Grass/Gravel/Snow selected on the Terrain Response, switching to Mud/Ruts when required. At one section – which was a bit of an axle twister – R2 had one wheel in the air several times! When we encountered a steep climb I let R2 negotiate the start in first gear with the engine pulling along at idle, once it got steeper I just gave him a bit of welly and he simply shot up the slope with no drama. Here’s our navigator checking the byway signs. As the Plain is a military training area, access to civilians is controlled and we had to ensure the byway we wanted to drive was open. We didn’t want to get shot at! The only lane I had a problem with was a fairly narrow one enclosed by hedges and small trees and it was inevitable that these would rub along the side of the vehicle. Half way along, we encountered a huge pile of fly-tipped rubbish. It’s so disappointing; some unscrupulous people will fly tip anywhere just to save a few bucks. Getting past this obstacle wasn’t easy to do without risking a scratch or too and unfortunately I collected a few. No lasting damage though. Now that I’ve washed the mud off I’m sure the scratches will polish out with a bit of elbow grease. I love the openness of the Plain. If the weather’s nice you’ve got all that “Big Sky”. Posted on 18 May 2015 18 May 2015 by Wizzard PrangPosted in Freelander, green-laning, Land Rover, off-roadingTagged Freelander, Land Rover, life, Mud, outdoors. Previous Previous post: Is it an Evoque Plus ?